Commissioned by LVNH Chairman and CEO, Bernard Arnault, and designed by Frank Gehry, the new Fondation Louis Vuitton building has been built on the Jardin d’acclimatation in the Bois de Boulogne public park in Paris. The design museum will be “principally associated with artistic creation in all its forms” according to a statement released by the Louis Vuitton company. The building will be home to the permanent collection of works belonging to the Foundation and Arnault, and two annual temporary exhibitions and musical events will feature in the auditorium. Gehry described the building as “a veritable ship amongst trees,” undoubtedly referring to the beautifully curved glass-roofed structure located within the Parisian park. He notes that from the beginning the design would feature a solid piece inside what“We did study the program as almost like a floating ship... it was like a box and then the rooftop would be a garden and then a glass cover for the garden,” he said. The concept was created using 3,600 glass panels that form the shape of 12 'sails.' Each panel is unique and was moulded in a special furnace in Padua, Italy. The sails layer fluidly over each other, forming a 13,500 square metre glass canopy. Fondation Louis Vuitton were uniquely moulded and the complex geometry of the glass was created using Digital Project – a software program developed by Gehry Technologies. Two hundred wooden larch beams curve to support the lightweight glass, while a stainless steel lattice ensures the glass holds “immaculate longevity.” The glass is also intertwined between 19,000 sheets of Ductal – an ultra-high performance fibre-reinforced concrete which makes up the facing. Stattler also discussed new technology that allows fabricators to produce glass more economically. Though this process was used to create the Foundation’s sails, moulding or casting glass is quite expensive and a technique called cold bending where “flat glass was pushed into a frame to give it a just a slight bend” is more economical. Stattler also referred to Gehry’s IAC Building as an impressive project that features curved glass. This was Gehry’s first New York project, and he used cold bending to shape the 1,437 panels that made up the sail-inspired building. A similar technique was used on Gehry’s famous Walt Disney Concert Hall, where the stainless steel panels were cold-warped into shape. Glass can also serve as a vital connection between the built environment and nature – an essential component to Fondation Louis Vuitton’s design. Fondation Louis Vuitton sits amongst the 850 hectares of the Bois de Boulogne park and a further 300 trees were planted to give the garden back its original 19th century appearance. “In order to get it approved by the city, it had to relate to the garden, to the trees and the garden structure,” Mr Gehry said. 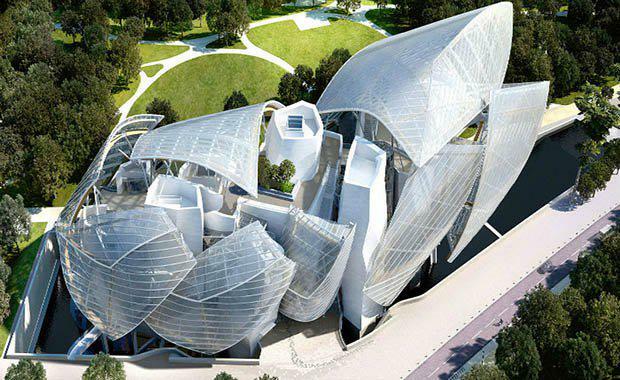 Mr Gehry described his design needed the impact of a “Grand Palais” or garden structure. The building is entirely transparent, abundant with natural light and an ability to mirror its natural surroundings. The Foundation Louis Vuitton building will be open to the public on October 27. For the opening of the Fondation Louis Vuitton, the artistic program will unfold in three successive stages between October 2014 and July 2015. Each stage will include a temporary exhibition, a partial presentation of the collection, and a series of events.